OP2758. 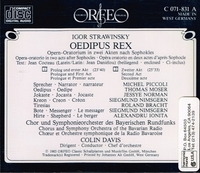 OEDIPUS REX (Stravinsky), recorded 1983, w.Colin Davis Cond.Bayerischen Rundfunks Ensemble; Jessye Norman, Thomas Moser, Siegmund Nimsgern, Alexandru Ionitza, Michel Piccoli, etc. (Germany) Orfeo C 071-831. Final copy!